As described in my first post, I reviewed the detailed data the Tokyo Electric Power Company (TEPCO) released, to understand the operation of Fukushima Units 1, 2, and 3. 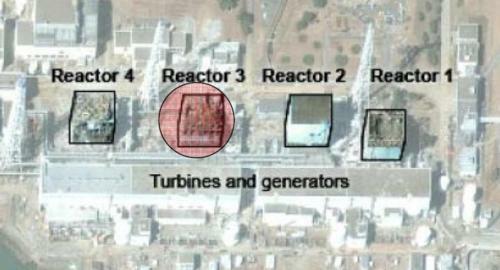 The available information for Unit 3 does not extend long after the arrival of the tsunami, and does not extend to the point at which fuel in the reactor core was damaged by overheating. Much of the available information ends at 4:05 pm local time, about 80 minutes after the earthquake occurred at 2:46 pm. The reactor shut down around 2:46 pm local time and remained shut down. Normal power supplies to in-plant equipment were lost about a minute later. It is assumed that this occurred when the operators manually tripped the turbine/generator per procedure. Both emergency diesel generators on Unit 3 automatically started and connected to their in-plant electrical buses within seconds of the power loss, restoring power to essential plant equipment. A safety relief valve (SRV) automatically opened around 2:52 pm to control rising pressure inside the reactor vessel. This SRV automatically re-closed when reactor pressure dropped. This SRV followed by two other SRVs cycled opened/closed periodically over the next 73 minutes to control pressure inside the reactor vessel. The water level inside the reactor vessel steadily declined as cooling water was discharged through the open SRVs into the torus. By 4:00 pm, the water level had dropped below the bottom end of the level monitoring scale. There’s no compelling evidence that any system was used to provide makeup flow to the reactor vessel from the time that the MSIVs closed around 2:48 pm until 4:00 pm. Around 3:38 pm, one of the emergency diesel generators stopped running. About a minute later, the other emergency diesel generator stopped running. It is assumed that the tsunami caused these failures. Around 4:02 pm, the RCIC system appears to have been placed in service. The data ends shortly afterwards at 4:05 pm. Details of my assessment of Unit 3 for the first 80 minutes after the March 11 earthquake are given here. My assessments of the early behavior of Unit 1 and Unit 2 are available at these links.